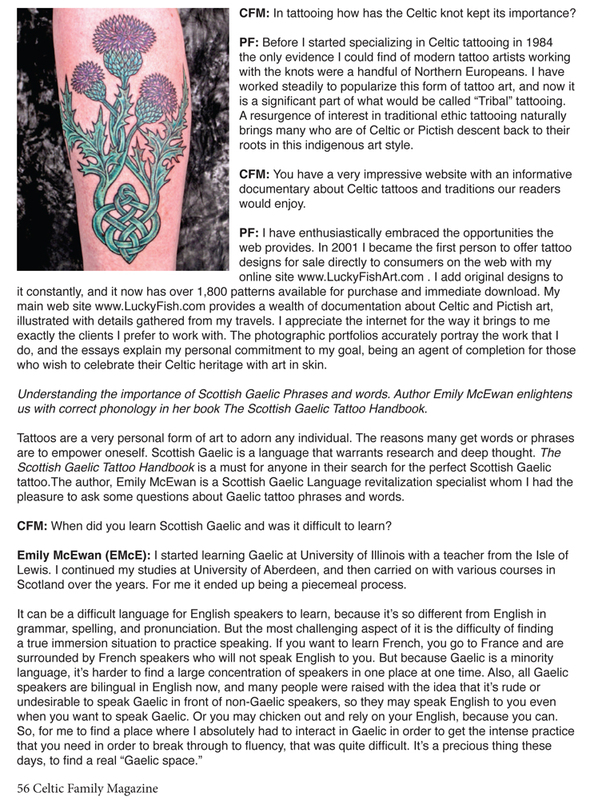 I am pleased to be featured in this article in Celtic Family Magazine, talking about The Art and Language of Celtic Tattoos. Pat Fish, a native Californian with Scottish roots, is an accomplished tattoo artist in Santa Barbara specializing in Celtic knotwork and Pictish art. Known as the “Queen of Knots”, her devotion and talent make her nationally recognized as a traditional Celtic Tattoo artist. Fish moved to Santa Barbara in 1975, and earned degrees in Studio Art and Film Studies from UCSB. After she graduated she taught a highly respected right-brain/left-brain drawing course for Santa Barbara Community College’s Adult Education Department for many years. Fish wanted to do art on her own terms full time so she started her tattoo career. I had the pleasure of interviewing her about her past and present body of work. CFM: When and what was it like when you first started tattooing? Pat Fish (PF): In 1984 I decided I wanted to do art full time for my career, and I picked tattooing even though I only knew one person who had a tattoo. He advised me to find the best mentor I could to teach me, gave me the name of Cliff Raven, and I was thus guided to the person who would shape my destiny. Raven’s example, of moral and technical precision, is what I aspire to do honor to in my work. I already had a university art degree, and a teaching credential for art, but I embarked on a new trade that became a coalescence of all the skills I had in deliberate focus. It has been a never-boring always exciting way to make my living ever since. There is always a new client, and a new challenge, to stretch my skills in a new way. CFM: What is the process of customizing a tattoo for a client? PF: Because Celtic tattoos can be quite complex, the process of designing custom ones involves more client involvement than some other styles of tattoos. I ask that the client come to the studio on the afternoon before, and we do a consultation where we discuss the size and placement desired, and explore the possible images. Eventually we get a design formulated, and I have overnight to get the drawing done before returning the next day to install it. CFM: You have Pictish ancestry from Clan Campbell and it is interesting that the Picts were known to paint the body. How did you find out about your ancestry and do you feel connected with this tradition? so it was not until I was adult that I found out my true lineage. It coincided with my having decided to learn to tattoo, so I took that as a sign that I ought to work to bring back the motifs from the ancient Pictish stones to life again in skin. The Celtic patterns in the manuscripts and on crosses are more accessible, but the enigmatic Pictish beasts and key patterns speak to me in a special way. CFM: What are your views on the origin history of the art of tattooing? There seem to be a few different versions. scar looked much more dramatic. Next thing you know people are using the intentional insertion of ash to make indelible marks in the skin. CFM: You have traveled all over Celtic Europe. What was the most inspiring place you’ve been? PF: The neolithic passage tomb Newgrange in the Boyne River Valley in Ireland is the single most inspirational place I have visited. Walking deep inside a hill, to experience the inner chamber opening up to reveal the spiral carvings in the walls, it is timeless and profound and humbling. CFM: What symbols of the Picts and Celts are you most inspired by? PF: I am always drawn to spirals, whether triple or double or single. They are the single most evocative form in art, speaking to an inner balance and rightness. Whenever possible I work with the spiral form, introducing the graceful curve into any design. They are the path to the center, and the return to the still point of oneness. Adding this extra dimension to tattoos takes them beyond the artistic and into the spiritual, where they enhance the physical body of the wearer and also engage the mind. CFM: Are there any of your tattoos that you would like to share the significance of? travels and aesthetic enthusiasms. In Celtic style I have the triple spiral from Newgrange, a sleeve of interlacing knot work, the Aberlemno cross circle also known as the seven spiral wheel of Taranis, and an anklet band of knots. CFM: Historically, what value was placed on Celtic knots? PF: Many people like to believe that Celtic knots are a code, a language, a symbol system. But there is no reason to think they are anything other than beautiful geometric embellishments. The level of intricacy and detail preserved in the ancient illuminated manuscripts is incredible, and the carvings on the ancient high crosses are testimony to the passion for the interlaces that form the knots. It is my personal belief that the knots started with an equestrian and maritime society, with braided leather horse tack and ropes, and with the intricate knitted woolen clothing that featured patterns unique to families and clans. CFM: In tattooing how has the Celtic knot kept its importance? the only evidence I could find of modern tattoo artists working with the knots were a handful of Northern Europeans. I have worked steadily to popularize this form of tattoo art, and now it is a significant part of what would be called “Tribal” tattooing. A resurgence of interest in traditional ethnic tattooing naturally brings many who are of Celtic or Pictish descent back to their roots in this indigenous art style. CFM: You have a very impressive website with an informative documentary about Celtic tattoos and traditions our readers would enjoy. PF: I have enthusiastically embraced the opportunities the web provides. In 2001 I became the first person to offer tattoo designs for sale directly to consumers on the web with my online site www.LuckyFishArt.com. I add original designs to it constantly, and it now has over 1,800 patterns available for purchase and immediate download. My main web site www.LuckyFish.com provides a wealth of documentation about Celtic and Pictish art, illustrated with details gathered from my travels. I appreciate the internet for the way it brings to me exactly the clients I prefer to work with. The photographic portfolios accurately portray the work that I do, and the essays explain my personal commitment to my goal, being an agent of completion for those who wish to celebrate their Celtic heritage with art in skin. Understanding the importance of Scottish Gaelic Phrases and words. Author Emily McEwan enlightens us with correct phonology in her book The Scottish Gaelic Tattoo Handbook. Tattoos are a very personal form of art to adorn any individual. The reasons many get words or phrases are to empower oneself. Scottish Gaelic is a language that warrants research and deep thought. The Scottish Gaelic Tattoo Handbook is a must for anyone in their search for the perfect Scottish Gaelic tattoo.The author, Emily McEwan is a Scottish Gaelic Language revitalization specialist whom I had the pleasure to ask some questions about Gaelic tattoo phrases and words. CFM: When did you learn Scottish Gaelic and was it difficult to learn? Emily McEwan (EMcE): I started learning Gaelic at University of Illinois with a teacher from the Isle of Lewis. I continued my studies at University of Aberdeen, and then carried on with various courses in Scotland over the years. For me it ended up being a piecemeal process. CFM: You mention in your book that official Scottish Gaelic spelling rules have been modified twice in the past 35 years, how does one decide which spelling to use? EMcE: Some fluent Gaelic speakers have very strong opinions about which spelling system is the best. The Scottish Gaelic Tattoo Handbook contains two different spelling suggestions for many of the glossary entries. In most cases, the spellings are not drastically different – sometimes it’s only the direction of an accent mark on one letter that makes the difference. can use the Nova Scotia Gaelic spelling, which is based on the spelling system from before the current standard was adopted in Scotland. CFM: Where are the places in the world where Gaelic is still spoken? EMcE: Scottish Gaelic is still spoken in Scotland and in Nova Scotia, Canada. According to the latest census statistics there are about 58,000 speakers in Scotland and 1,200 speakers in Nova Scotia. There are also small communities of new Gaelic speakers living all around the world, from the United States to Germany to Australia and New Zealand! CFM: What are the most common mistakes in getting a Gaelic language tattoo? EMcE: I think the most common mistake by far is picking something in English, like the lyrics to a pop song, and then asking someone online who you don’t even know to translate that! Song lyrics are really tricky and can be quite difficult and time-consuming to translate. And they’ll never have exactly the same meaning as they do in the original language. Asking someone to do that translation work for free, and putting the burden on them to give you the perfect words for your tattoo, is unfair. The other most common mistake now is using Google Translate. No one should ever rely on it to get a translation for something permanent like a tattoo. It’s OK for giving a rough idea of the meaning, but translations from Google Translate tend to be full of mistakes! CFM: Is there anything you would like someone to know as they search for the perfect Gaelic word or phrase? EMcE: I would say that the more time and effort you take to familiarize yourself with the richness of Gaelic language and culture first, the more likely it is that you’ll find something that’s deeply meaningful to you and also truly honours Gaelic culture.